Sometimes, I don't know how to write about important matters. Please bear with me, because this subject is far more important than it might initially seem. When most people encounter the word species , it is either in the context of a biological discussion, or the word is used as a metaphorical borrowing from discussion of that sort. It actually has more general meanings, the broadest simply being class of things of shared characteristics. But what concerns me here is indeed its biological sense. Most people who have any notion at all of the word derive their understanding of the biological signification from a combination of observed use and whatever was told to them by middle- and high-school texts of alleged science. Many of them know that organisms are categorized hierarchically, and that species is a finer category than genus. But, if asked to describe the classification of animals as different, say, as are cats and dogs, far more people would descibe them as of different species than as of different family or as of different genus . There is an inferred sense that difference in species is rather fundamental. A taxonomic grouping ranking next below genus and subgenus, which contains organisms that are uniquely distinguished from others by certain shared characteristics and usu. by an inability to interbreed with members of other such groupings; such a grouping as denoted by a Latin binomial, and freq. subdivided into subspecies, races, varieties, etc. ; the organisms of such a grouping. That bit about inability to interbreed is a bit loose; for example, most biologists would classify horses and donkeys as of different species, though they can produce offspring. However, a striking characteristic of those offspring is that they cannot themselves produce further offspring. The infertility of those offspring is usually cited towards explaining the speciation. In any case, The SOED hedged with that usu. because some biologists categorize animals as of different species though they can interbreed down through indefinitely many generations, as in the case of coyotes (C. latrans) with wolves (C. lupus). Over some decades, anthropologists disagreed over whether to classify Neanderthalers as a distinct species, H. neanderthalensis, or as a sub-species of H. sapiens. As there was no way to observe potential interbreeding, early disagreement turned on issues of overt morphology — the shapes of skulls, dentition, &c. But then interbreeding became, in a sense, potentially observable as it became possible to extract and analyze DNA from remains of Neanderthalers. Initial results (quite surprising to me) suggested no interbreeding, and it became more commonly accepted that they should be considered a distinct species. However, when later genetic evidence began to show the presence of Neanderthaler genes in some modern populations of H. sapiens, the practice of treating them as a distinct species was not universally abandoned. It is still common to classify Neanderthalers as a distinct species, though this implicitly means that species is not being used with the usu. signification. And when, far more recently, a similar archaïc population, the Denisovans, were distinguished, it became fairly common also to categorize them as a distinct species, though their genes are likewise found in some modern populations of H. sapiens. The author or authors blithely refer to the Neanderthalers, to the Denisovans, and to an additional, hypothesized archaïc population as distinct species without explaining whatever is there meant by the term. A large share of readers will regard the archaïc populations as not fully human, and infer that different ethnic groups have more or less genetic material that is not fully human. It will be inappropriately inferred that some ethnic groups are thus less human or more human than are others. Anthropologists and biologists who talk with lay-persons, and especially with journalists and with other informal educators, need to emphasize the arbitrariness in use of the word species , and these scientists need to impress upon their audiences that the word should be avoided or explained in all popular-science journalism that touches upon our relationships with archaïc populations. However, a few decades ago, some social theorists began insisting upon a new definition of racism , under which one could not be called a racist unless one not only were prejudiced against some racial group, but had social power. Devotees of this new definition variously baldly restate it, as if the restatement makes it so, or cite the theorists, as if such citation makes it so. Alarms really ought to go-off about the redefinition of racism . The original concept was quite coherent and useful; if it were not coherent, then the redefinition (which essentially adds a condition) would inherit the incoherence. Racism on the part of people with little social power still has significant social consequences; any legitimate use of the new concept is far more sharply limited than that of the original concept. Let's imagine that someone prejudiced against those outside his own major racial group makes a solo walking tour of Los Angeles. As he travels from one neighborhood to another, he gains or loses social power as the ethnic compositions of those neighborhoods vary. His beliefs about the relation between race and merit needn't change (and should not be expected to do so much if at all). Yet by the mere act of travel through a large city in which ethnic groups are not uniformly distributed, under the redefinition he would repeatedly go from being a racist, to not being a racist, to again being a racist. It would be extraordinary and dangerous to make a solo walking tour of all of Los Angeles, but a great many people regularly move across communities of different ethnic composition. Application of the proposed redefinition of racism would routinely become unworkable, under circumstance in which the standard definition remains quite workable. There are certainly legitimate applications of the concept of socially empowered racism, but in those applications we can call it socially empowered racism or something similar. When a concept loses its associated symbol, it becomes harder to discuss or even to think about that concept. Further, the response to symbols is largely emotive. Whether people learn by reason that something is good or that it is bad, or they are simply led to accept some valuation by imitation of those in their society, people come to associate positive or negative feelings with the words used for those things. Old concepts given new words don't provoke the same response; old symbols given new meanings carry with them some or all of the old feelings. Those who have adopted a new redefinition of racism can thus escape the recognition of racism, and the felt need to condemn some instances of racism, by allowing themselves to believe that some people simply cannot be racists , by virtue of their social standing. We are simply dealing with an attempted hijacking of language, for purposes of subverting clear thought and discussion. That is most plain when the word racism has been introduced into some discourse with its standard definition, and in response it is insisted that something conforming to that original definition is not racism because it does not conform to the proposed redefinition. But any non-standard use that is not flagged as such is still a subversion of rationality. Those who have participated in the attempted hijacking are knaves or fools or both. Years ago, when I was in graduate school, I got into an argument, about a real-world crime statistic, with another student who didn't have much math-sense. The mathematics itself is very simple, and yet at least one implication of it seems to run counter to the intuïtions of many people. Let's say that a population p is divided into groups, each i-th group with population pi p = ∑(pi) And let's say that the i-th group has a propensity ci to commit crimes, such that ci · pi gives the sum of the crimes committed (however measured) by members of that population. If criminals from within each group draw their victims with each person having an equal chance of victimization regardless of his or her own group, then the proportionate share of victims that they draw from the j-th group will be pj / p The total number of crimes then committed against the j-th group by members of the i-th group will then be (pj / p) · (ci · pi) and the ratio of i-on-j crime to j-on-i crime will be [(pj / p) · (ci · pi)] / [(pi / p) · (cj · pj)] = ci / cj So, if ci = cj, then the ratio of i-on-j crime to j-on-i crime will simply be 1:1. The other graduate student had been sure that, if group i were the smaller group, then the ratio should be larger than 1:1, because group j furnished more potential victims. The proper intuïtion here is that, if one group is larger than another, then it furnishes proportionally both more potential victims and more potential victimizers; or, to say the same thing differently, if one group is smaller than another, then it furnishes proportionally both fewer potential victims and fewer potential victimizers. If we see a very different ratio, then the difference implies that one group has a greater propensity to criminality than the other, or that one group is seeking (or avoiding) the other in its acts of criminality, or both. It should be noted that members of the j-th group may be sought or avoided for reasons other than their being members of that group as such. For example, members of the j-th group may happen to have more portable wealth. Still, if one sees a ratio of, say, about 50:1, then it's hard to explain this lop-sided ratio in terms simply of the j-th group having more wealth, or of the i-th group simply having a greater propensity to criminality. With a ratio like that, one should expect that members of the j-th group are indeed being targetted for being in that group, by members of the i-th group. Some weeks ago, the Woman of Interest spotted an interesting deck of cards on eBay. The deck was miniature, Disney-themed (Mickey Mouse on the backs and on the box), and dated from the late '30s or perhaps 1940. I later found a similar or identical sort of deck listed. These decks are very appealing, but there's something disturbing about them as well. 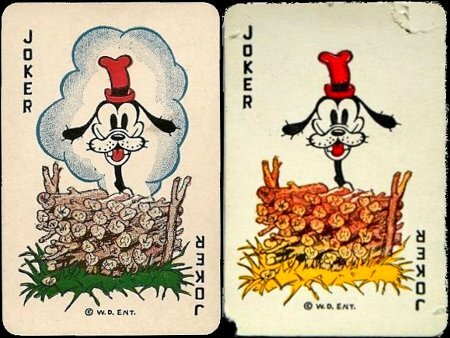 Here are the joker cards shown in the listings: The two designs, of course, are basically identical except for coloration and for the presence of a background cloud in one and not in the other. I don't yet know whether these cards represent two designs found in each deck, or distinguish one sort of deck from another, but I believe that the latter is the case. In any event, each pictures Goofy's head and neck sticking-up from within or from behind a woodpile. It refers to a condition where something significant, typically undesirable, is believed to be concealed. This unpleasant metaphor is no longer current in America; in fact, I had to relate and to explain it to the Woman of Interest, who had never encountered it, and I had to double-check on its exact meaning. But it used to be quite current here, and certainly would have been when those cards were designed and when they were released. I cannot help but think that in the mind of the designer, these graphics are meant to be an allusion to that expression, with the underlying notion being that Goofy is an analogue, within the Disney universe, of the stereotypical black character from that era. I draw attention to the point that one cannot infer that this is how Disney or the rest of the firm conceptualized Goofy; an alien analogy would not be recognized as such, and the image could have been seen as simply silly. It evidently retains some currency in Britain, where state and corporate officials continue to let it slip in public! To-day, I was there to get dinner. At a near-by table sat three blue-collar guys, my age or older. They looked as have white blue-collar guys for most or all of my life. But they were talking sincerely and unaffectedly about fighting a problem of sexism and racism at the place at which one of them worked, with the victim of the sexism being a woman. That's not the sort of conversation that such men would have had in my childhood. The sun was going down, but my day brightened a bit.